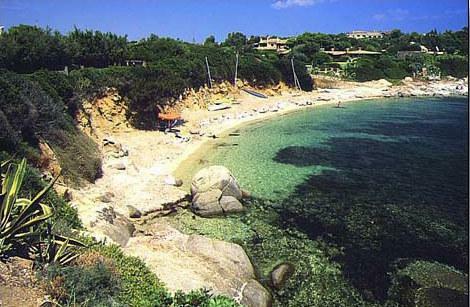 A remarkable property directly on the beach in a secluded bay in the South of Sardinia named Villasimius. Surrounded by the clear turquoise waters of a marine nature reserve, the villa's south-western orientation means that it has views of some of the most beautiful sunsets in Italy and also remains warm and sunny well into November. 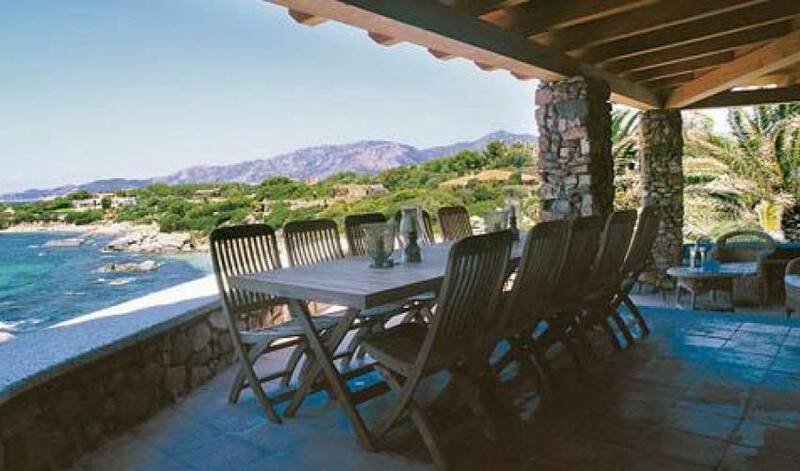 The villa has been completely renovated during 2008, using natural materials and is fitted out to a high standard with air conditioning in all the rooms. 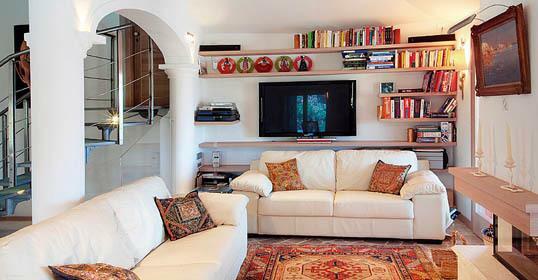 This Sardinian villa is composed of six en suite bedrooms including a self-contained studio. 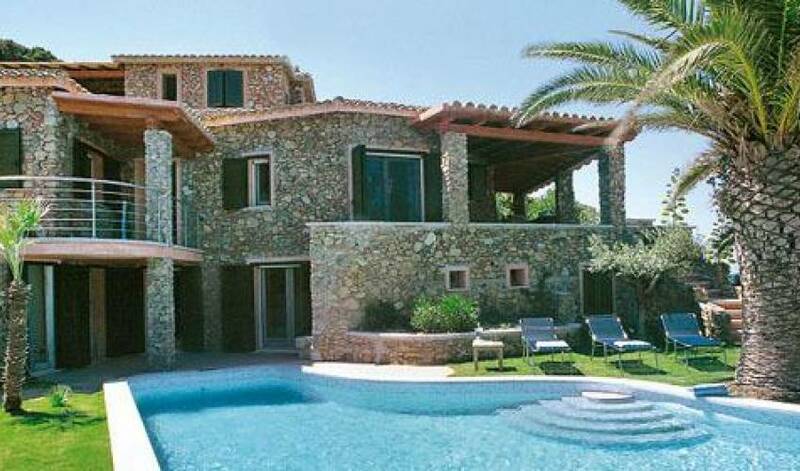 The villa is built on three levels: the middle level is a large open space with a dining area, kitchen and lounge. This large and luminous living area has various French windows giving access to the portico and the garden from different sides. The portico has a table which seats 14 for dining looking out to sea and wicker armchairs, which are perfect for sitting with a glass of wine to watch the sunset. 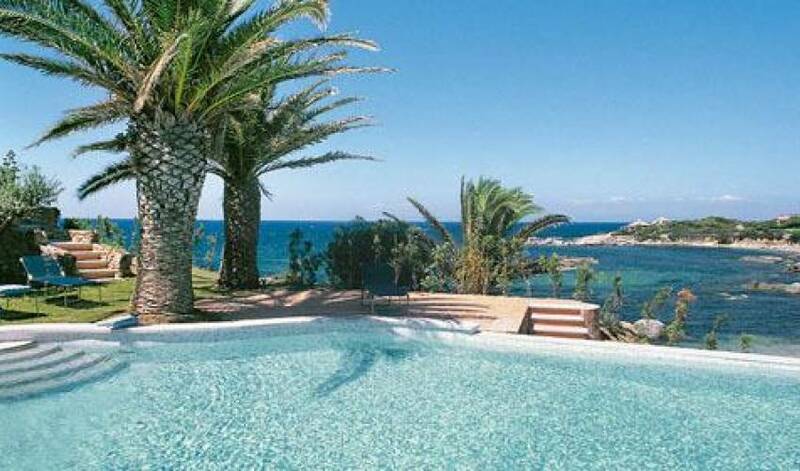 The lovely small garden, which slopes down to the beach, boasts a large swimming pool, terraces, a barbecue area and a pool shower. The crystal clear waters and wonderful white sand which starts where the garden ends is a public but rather exclusive beach. 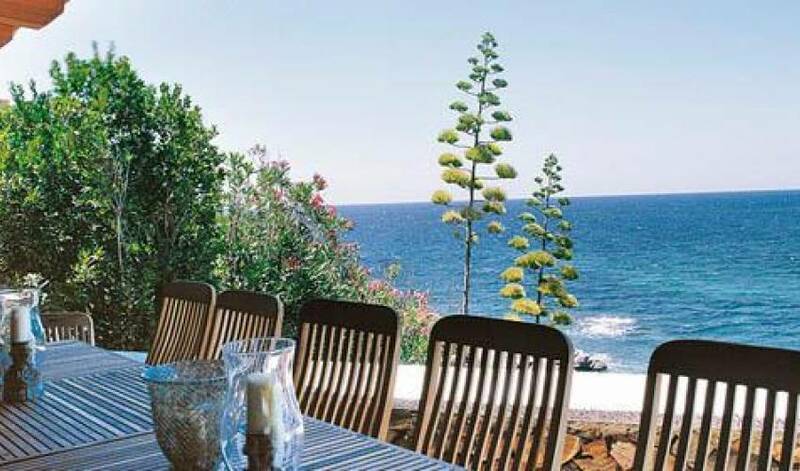 In general it is used by the owners of the villas nearby and is never crowded even in the height of summer, a narrow lane, which connects the various villas on the promontory, also leads down to the beach. All kinds of boats and aquatic equipment can be hired at the nearby marina, where restaurants, golf, equestrian centre, water sports, scuba diving, can also be found. It is possible to walk to the marina from the villa. The car park is outside of the villa grounds and there are approximately 70 steps from the car park to the villa. 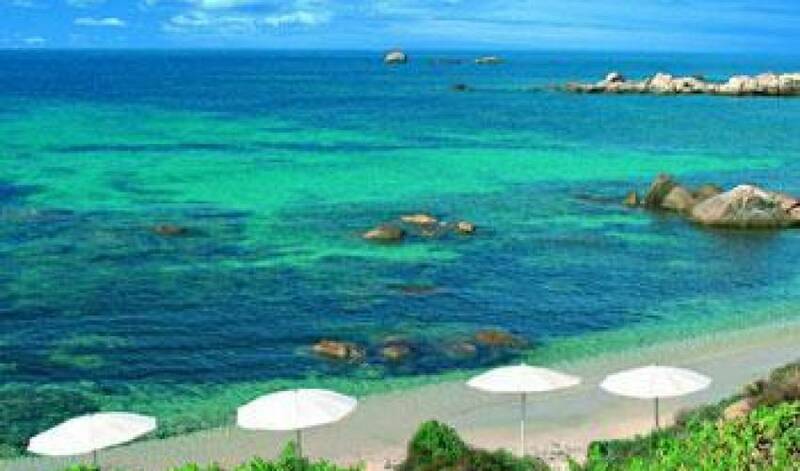 Villasimius is a tourist town, situated in the south-east coast of Sardinia, where there are some of the most beautiful beaches in the Mediterranean. 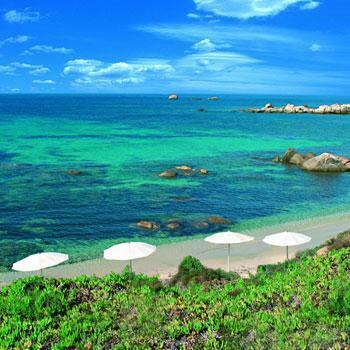 The area where Villasimius is situated is considered one of the most famous and valued places of Sardinia, thanks to an enviable natural position, characterised by long white sandy beaches and delightful hidden creeks, cliffs, gulfs, inlets and unpolluted isles. The natural environment is the most important aspect of a holiday here. In fact, many natural attractions can be found, such as an area which has been protected by the institution ?Area Marina Protetta? (Protected Sea Area) for a few years. 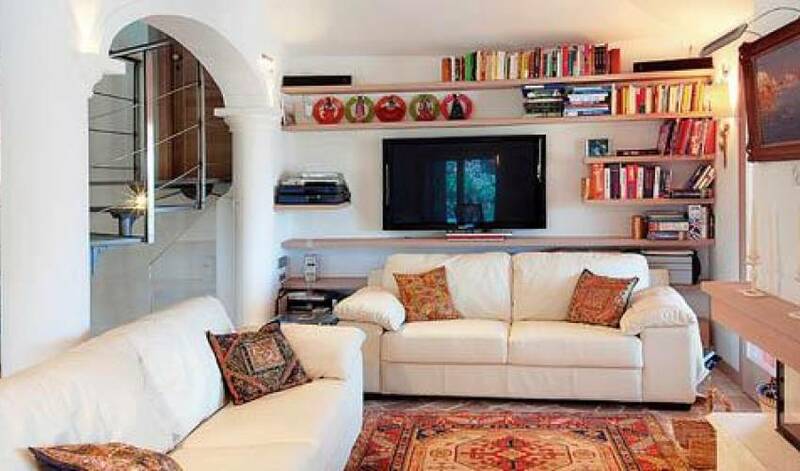 First floor (230m2): large open plan living room with dining area (table for 12 people), sitting area with fireplace and open plan kitchen with work station. The living area opens onto a porch with armchairs and table suitable for 12 people. From the porch, steps lead to the pool area. One bedroom with 4 bunk-beds with en suite bathroom with bathtub and wall shower. Second floor: master bedroom with terrace, en suite bathroom with double basin, bathtub and wall shower. Ground floor (pool level): one bathroom with shower, one double bedroom with direct access to the garden, en suite shower room with double basin, laundry room, sea view, one twin bedroom with en suite bathroom with bath with a shower fitment on the wall in the bath, one double bedroom with en suite bathroom with bathtub with wall shower. Poolside Ground floor: one self-contained studio bedroom accessed externally, breakfast area, shower room. Outdoor Granite table for 12 people and BBQ. Equipment: infinity swimming pool with internal steps (15m x 7m - 1,1m x 1,6m depth), mobile BBQ, A/C in every room, computer with ADSL Internet connection, microwave, satellite TV, CD player, DVD player, radio, flat screen TV (large flat screen with home cinema projector), laundry room, dishwasher, washing machine, telephone, mosquito nets. Notes: 70 steps downhill to the entrance of the villa, no pets allowed, cook service on request. Small supermarket in the marina 3 Km, shops in Villasimius 6 Km, nearest restaurant within walking distance (3 min walk), Tanka Golf Course 3,5 Km, beauty spa in a luxury hotel right next door. 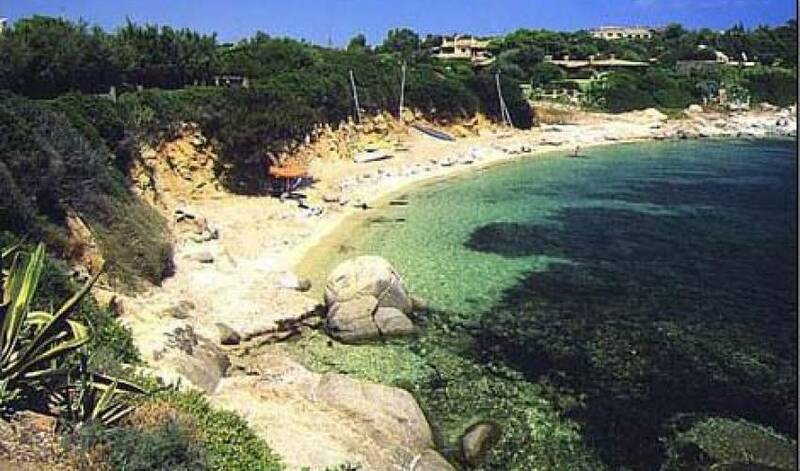 Villasimius 6 Km, various sandy beaches within 15 minutes, harbour (marina) in Capo Carbonara 1,5 Km-15 minutes walk, Cagliari 65Km.Airport: Cagliari (Elmas airport) 1 hour. This price includes linen, charges (electricity up to 330KWh/week), maid service (4 hours once a week), final cleaning and Internet connection.